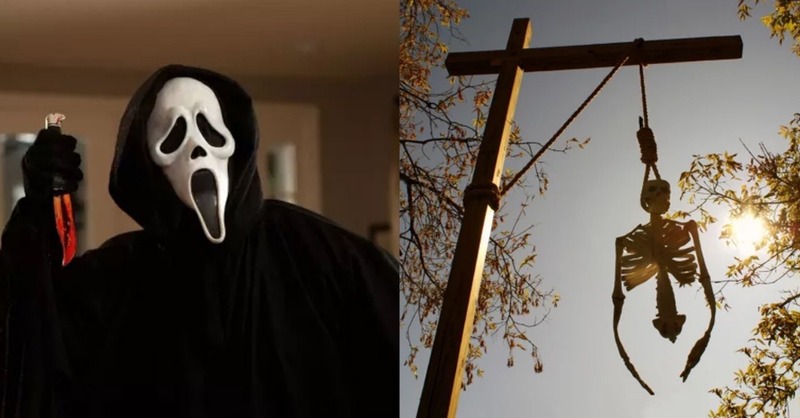 Normally people focus more on decorating the interior of their homes in the holiday season. But, in order to achieve the complete festive cheer effect, it is important to adorn your house on the outside too. 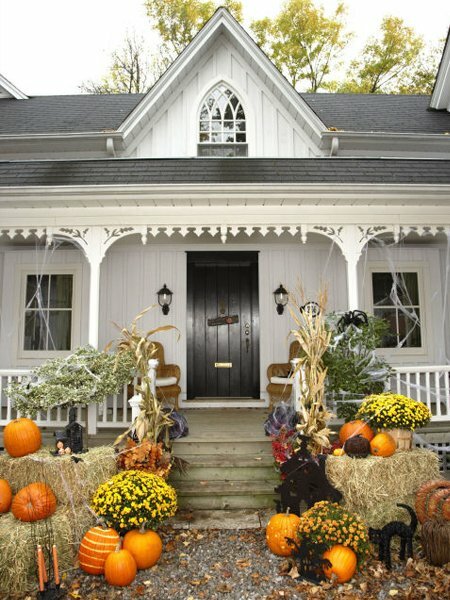 If you are on the lookout for wicked outdoor Halloween decoration ideas, then you have come to the right place. The following fancy choices for outdoor décor will definitely boost your creativity and give you something to keep busy with for the upcoming holidays. 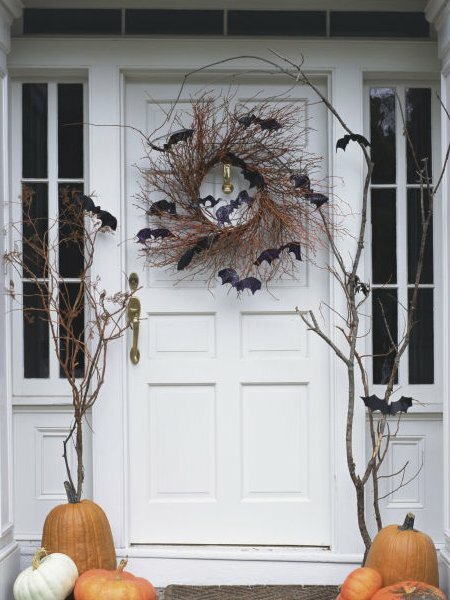 There is no shortage of decoration ideas that you can implement this Halloween party. Getting a right decor for party decorations is important, you need to have the best decor ready for your guests. 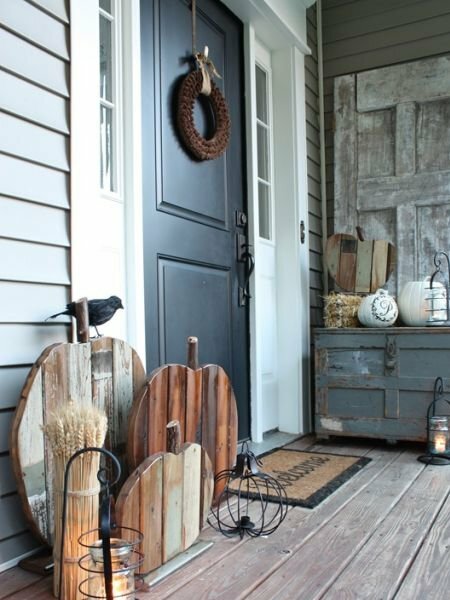 We collected a large range of outdoor Halloween decoration ideas that you use this Halloween to welcome your friends. 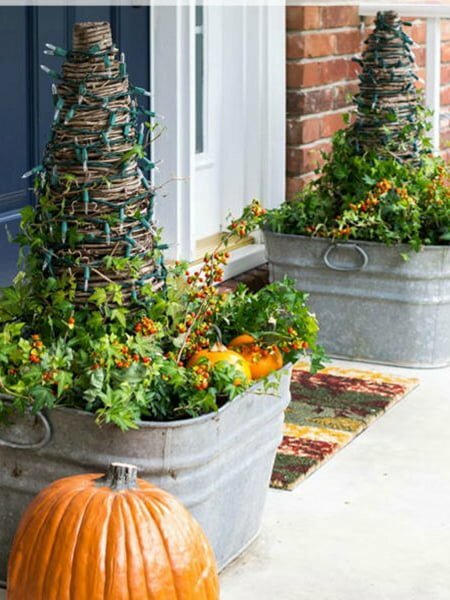 Using old vintage bath tubs as planters for your front porch is a genius idea for easy and innovative outdoor Halloween décor. 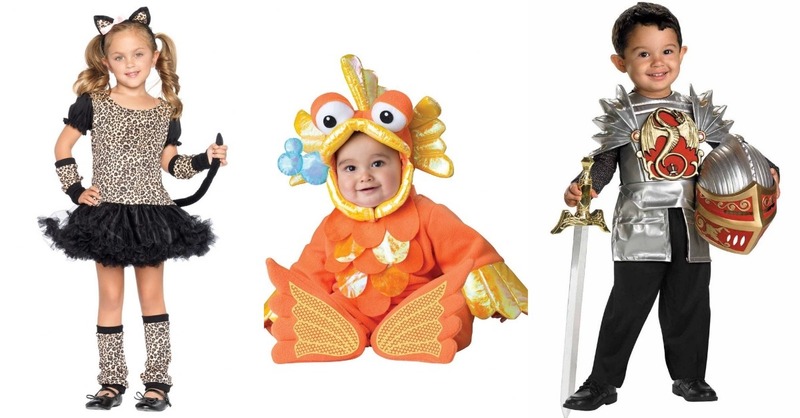 Everyone goes with the orange classic Halloween color theme. 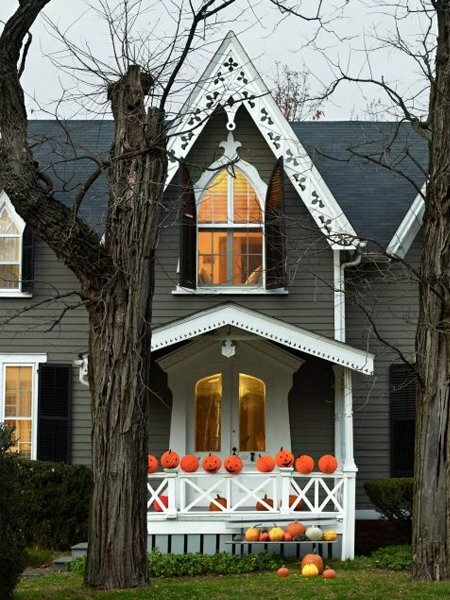 Paint your pumpkins white instead to give the “white picket fence” sleek and sophisticated feel. 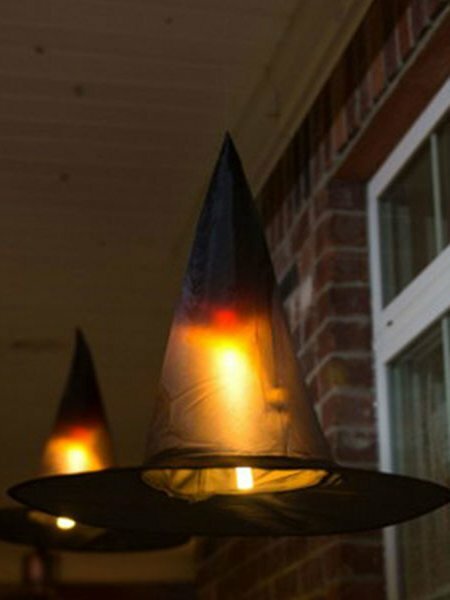 These spooky floating witch hat lamps add a creative spooky air to your garden. Kids and adults, alike, will love it. 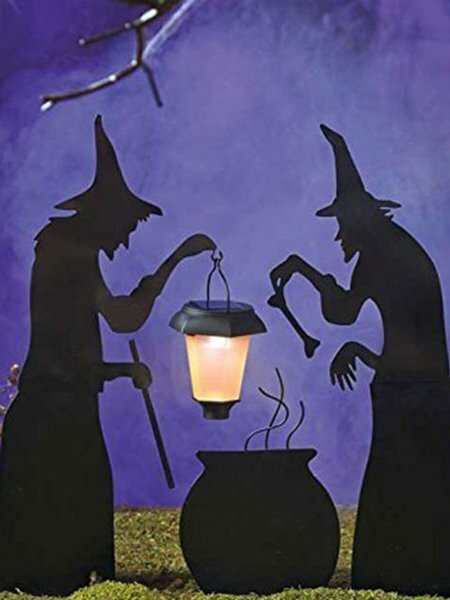 These spooky witchy silhouettes will add the perfect touch of Halloween to your backyard or front porch. By using tissue paper balls, you can create your own Jack o’ Lanterns with little to no effort at all. Besides, they look absolutely creepy. 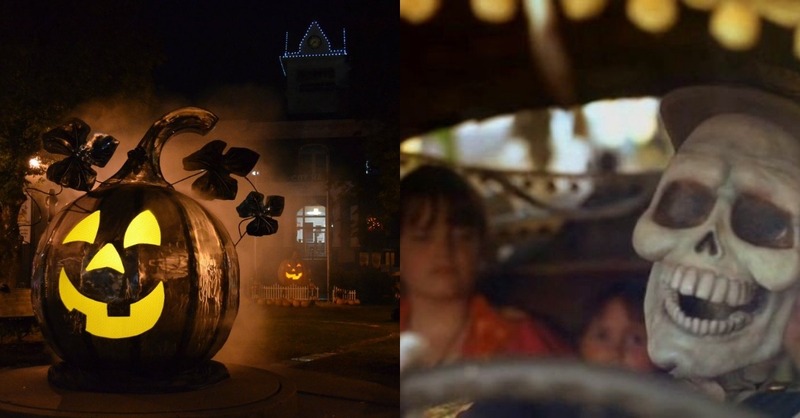 Instead of turning all your pumpkins into Jack o’ Lanterns, use the hollowed out pumpkins as planters instead. 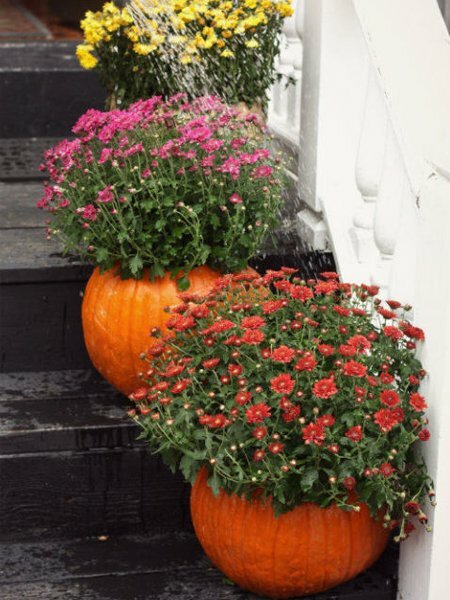 You can plant fall mums in them to give off a Fall festive cheer. 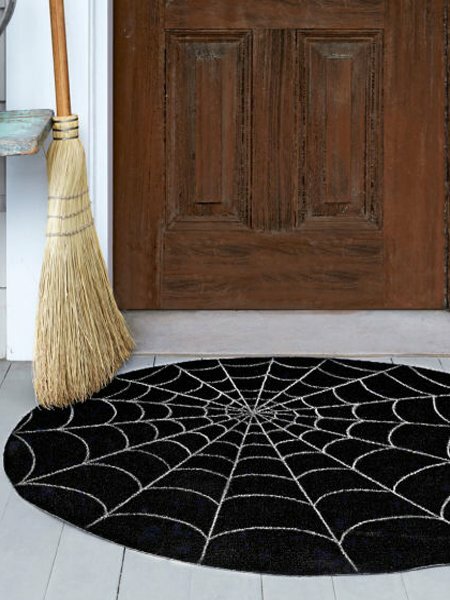 A spider web doormat is a great way to greet your hallowed guests and friends this Halloween. 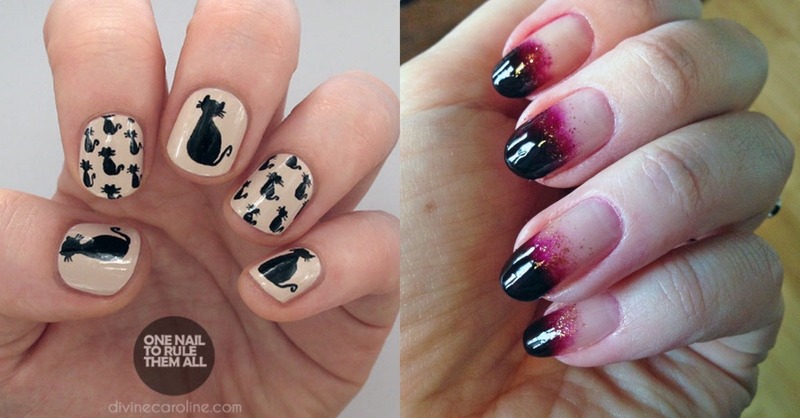 It is fun and easy to create. 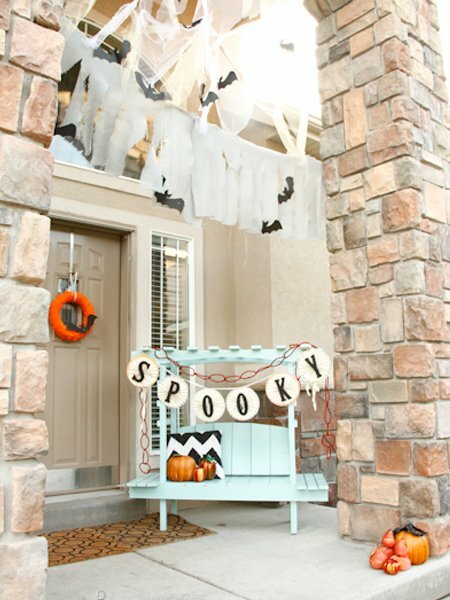 Any trickster stopping by your front porch will be delighted with this spooky overhanging archway. 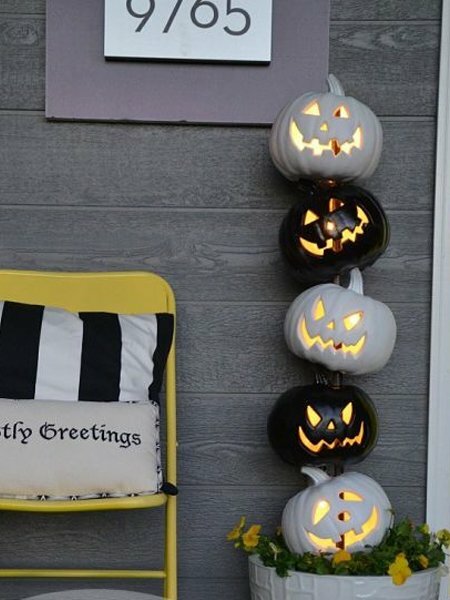 An innovative and eye-catching display, these stacked black and white pumpkins will steal the limelight any day. 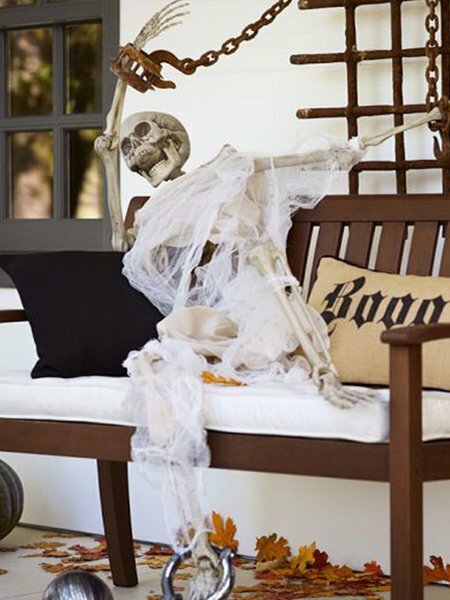 If you have a bench on the front porch, seat a life-sized skeleton on it to greet your friends this Halloween. Pumpkins wither away and rot pretty soon. 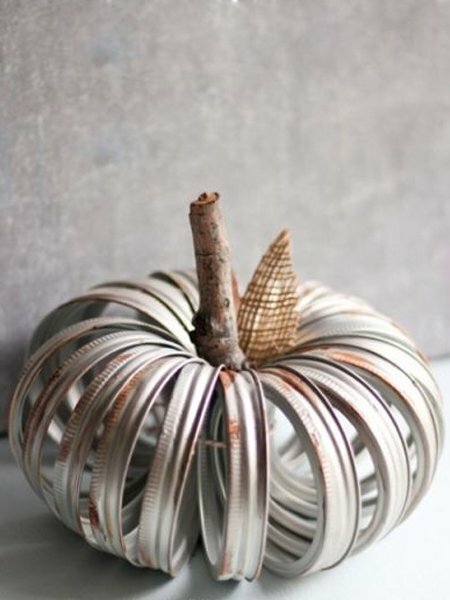 Settle for a permanent pumpkin that you can pull up every year with this canning ring pumpkin. 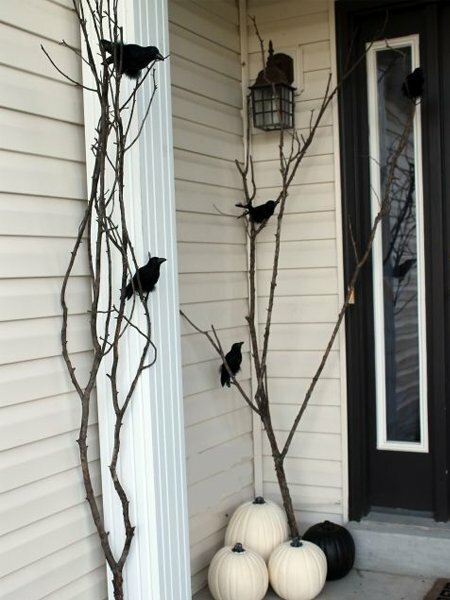 Call all your witchy friends to your abode this Halloween and greet them at the front door with a raven ensemble to make them all grin toothily. 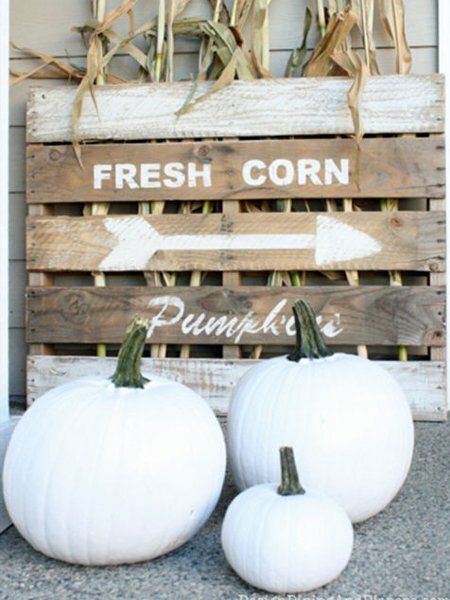 For a unique welcome, frame your front door with wood pumpkins instead of real ones. 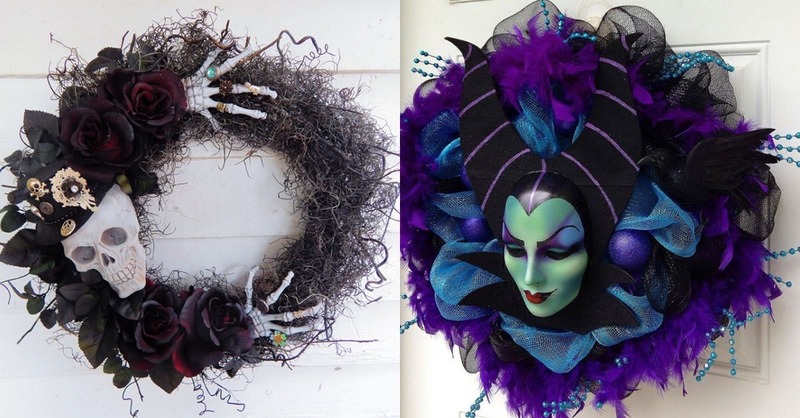 Now you can rest easy knowing your front door will look far more hallowed and welcome than on any other day of the year. 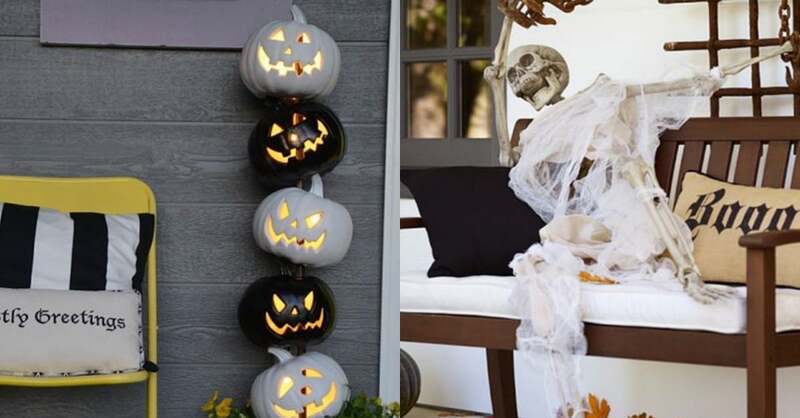 These great outdoor Halloween decoration ideas will repurpose your front yard remarkably. 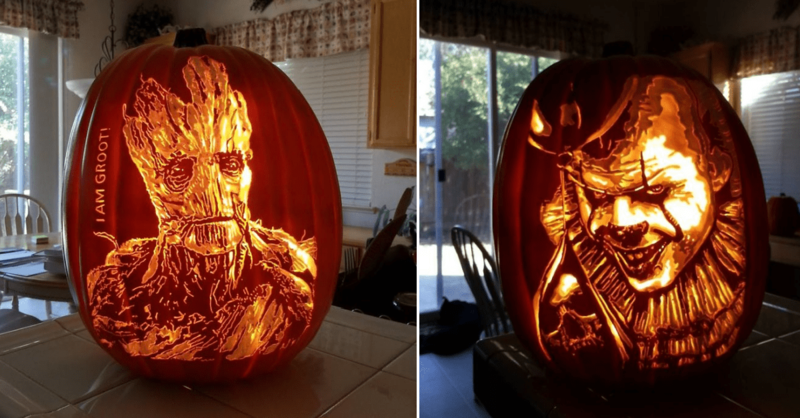 Who said Halloween decorating had to be boring?